204 pages | 4 B/W Illus. 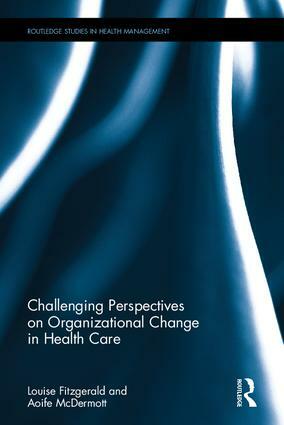 This volume provides theory and research on organizational change and predominantly features the application of these ideas to the health care domain, broadly defined. It addresses enduring issues in advancing to an effective health care system. The aim of this book is to offer an accessible and readable text aimed at provoking thought and questioning, and aiding creativity. It proffers arguments and ideas which are firmly based in empirical data and evidence, so that the reader may make informed personal evaluations. This book is designed to furnish a comprehensive theoretical basis for understanding organizational change in health care, as well as selected core issues of contemporary and future importance to the provision of effective care within sustainable systems. A series of coherent themes are addressed throughout the book from differing perspectives. However, every chapter has been written to standalone and be read independently. Each offers resources relevant to its’ focal topic, in the form of references, case studies and critique. Setting out a future research agenda, the book will be vital reading for organizational change researchers and practitioners in the healthcare industry. "… the authors do offer some important recommendations (Chapter 10). First, those who trumpet the need for ‘transformational’ and ‘disruptive’ change should familiarise themselves with the substantial evidence base against this approach and learn the advantages of what they call ‘accumulative change processes’ — humbler, less radical efforts that aim not to disrupt or destroy the complex infrastructure that forms the fabric of our healthcare organisations." 1.Theories of Organizational Change: Transformational Change as a Developed Theory? 3. Organization Development in Health Care: A Good Fit? Louise Fitzgerald is a Visiting Professor at Saïd Business School, University of Oxford, UK. Aoife M. McDermott is a Senior Lecturer in Human Resource Management at Cardiff University, UK. The health care sector is now of major significance, economically, scientifically and societally. In many countries, health care organizations are experiencing major pressures to change and restructure, while cost containment efforts have been accentuated by global economic crisis. Users are demanding higher service quality, and health care professions are experiencing significant reorganization whilst operating under increased demands from an ageing population. Critically analytic, politically informed, discursive and theoretically grounded, rather than narrowly technical or positivistic, the series seeks to analyse current health care organizations. Reflecting the intense focus of policy and academic interest, it moves beyond the day to day debate to consider the broader implications of international organizational and management research and different theoretical framings. What organization theories best shed light on current health care organizations? How does organizational change take place in health care organizations? How can novel health policy arenas (e.g. patient safety and quality) be conceptualised? Which narratives of health care reforming become influential and why in the political and policy domains? Who are the key actors in current health care reform? E.g. Rise of management consulting and think tanks. ‘doing more with less’ in health care post the 2008 economic crisis; what is the assessment of policies and strategies adopted? Why do countries vary in their experience of health care reform? What are the key developments within the health care professions and their implications for health care management? How important is the push from Science and Technology reshaping health care systems? What are the broader social and organizational effects of new ICTs in health care settings?